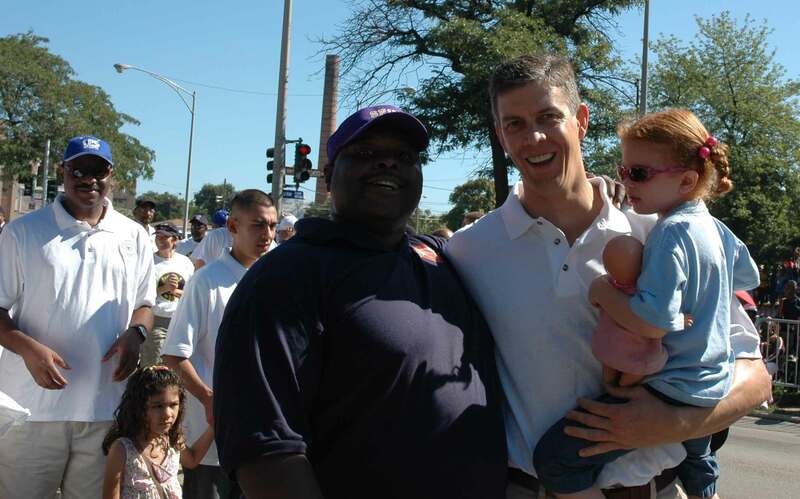 Former Chicago Schools Chief Executive Officer Arne Duncan (above right, at Chicago's Bud Billiken Day Parade on August 12, 2006) has now established the Chicago Plan to fire teachers from inner city schools as a national program thanks to President Barack Obama's appointment of Duncan as U.S. Secretary of Education one year ago. Substance photo by George N. Schmidt.Lately I've been trying to figure out which has been the lowest performing US bank. Can't tell if it was Goldman Sachs. Must not have been because they're giving their chief, Lloyd Blankfein, a $9 million bonus this year. Maybe it was J.P. Morgan Chase because they needed a multi-billion dollar taxpayer bailout. But it couldn't be them because their headmaster, Jamie Dimon, is due a $17.9 million bonus. Hell, whichever banks it was that nearly plunged this country into an economic Stone Age and martial law, they seem to have gotten a pass. Their excuse, "to big to fail", seems to have actually been bought. There has been no "reconstitution" or "turnaround" for anybody at Goldman, J.P. Morgan, Citigroup, BOA, Wells Fargo, and their gambling buddies at AIG. What a strange form of accountability! It's crazy. There are about a hundred teachers at this poverty-ridden community school in Rhode Island and if you added their salaries together and multiplied by a hundred you would not be even close to Blankfein's bonus. And even after the school's parents and the teacher's families and loved ones turned out in huge numbers to plead for justice. And even after it has been established beyond all doubt that a perfect correlation exists between a child's economic station and academic achievement as it is measured by standardized tests, these teachers are going to be destroyed. Destroyed is a strong word but suggest another one for arbitrarily and unfairly taking a working mother or father's livelihood, men and women without stock options and investment portfolios to tide them over until another job comes along. The school's students are living in the most desperate circumstances Rhode Island suffers. But no excuses, dammit! Accountability will be served, as long as you don't summer in a Swiss chalet. As a teacher in a "failing" inner city high school for 27 years now, I'm as powerless and vulnerable as my brothers and sisters in Rhode Island, but a warning to those hurting people whose only sin is to teach the children of the working poor. If you are making these decisions President Obama, then be warned. If you are making these decisions, US Secretary of Education Arne Duncan, then be warned. If the oligarchs, Gates, Broad, Bloomberg, are making these decisions, be warned. If the banks on welfare or the men of the Business Roundtable are making these decisions, be warned. History is replete with instances of empires, nations and societies turned upside down. When that happens the social order that shields the decision makers from their victims evaporates overnight. Suddenly humble working people like those at Central Falls High are able to reach out and touch their former overlords. Under this new set of circumstances you can probably look forward to a simple and straightforward one-question exam. And when they ask, "Why did you do these things to us? ", you had better have a good answer prepared. The strictest accountability will apply on this test. No bailouts permitted. After a 12 hour day at the Board of Education, waiting for justice and reason, we were not surprised to hear that with cowardice and under a cloak of formality, the members took the "last favorable vote". They didn't even have the courage to utter the names of the schools they decided to destroy. It didn't seem to matter that removing teachers who choose to work in neighborhoods where parents struggle to provide for their families is an assault against the children. It didn't seem to matter that teachers who often attended those schools or schools like them, will be lost to the children. How do you explain to a child that because you did not do well on a test, that your teacher will lose her job? That seems like an awful burden to place on a child, but that's just what happened yesterday. The even bigger crime will occur, though when the new teacher comes and decides the neighborhood is too tough, or the parents don't understand the "program" or the the kids are just too challenging. When that teacher leaves, what will that child think? He caused one teacher to lose her job and the next one doesn't care about him. Turnarounds are a destructive, smoke and mirrors scam. Ask some teachers at Orr High School. They'll tell you they have 14 assessments per quarter and don't really have time to teach. Ask teachers at NTA - if you can find any. I've never seen so many people trying to get out of there. Karen be patient and stay strong. We are destined to lose more battles to money power, like the ones at Orr in Chicago and Central Falls in Rhode Island, for awhile longer. But know we are destined to win the final battle, the one for all the marbles. After we vanquish their tormentors, we will be able to heal the children you speak so knowingly about.